Kathmandu's Tourist Hub Open For Business, But Is Anyone Buying? Since the earthquake, the streets of Thamel have been much quieter. They're not quite deserted, but they don't feel like a flourishing and buzzing tourist destination anymore. Fortunately, though, the spirit of the entrepreneurs in Thamel is very much alive. Many business owners have cautiously reopened their shops, and are anxiously on the lookout for the next tourist to walk through the door. Shops have started opening across Kathmandu, but the anxious wait for customers continues. It's been almost two months since the devastating 7.8 magnitude earthquake rocked Nepal. All major relief operations are well underway, and everyday life for Nepali people is slowly inching towards normalcy. But with a lack of tourists in the country since the earthquake, many businesses are stuck with a difficult proposition -- continue operations in Nepal, or shut shop? Thamel has long been Kathmandu's most popular shopping and dining destination for everyone from backpackers to international diplomats. Everyone who visited the city almost certainly walked through Thamel, perhaps taking a break in one of the many cafes and restaurants, while street hawkers and shopkeepers vied for their attention. Thamel is well-known for its hundreds of shops with meticulously designed Mandala paintings, eye-popping embroidered clothes, and many gorgeous brass, stone and wood statutes. It's also notorious for hustlers selling marijuana and hashish on street corners. Michael Schmitt, a tourist from Frankfurt, Germany, explores Thamel with his wife. "We had already booked this trip before the earthquake, and decided to come here anyway," Schmitt explains. "It's quiet, but Kathmandu looks pretty normal," he adds. Erika Keesee, a volunteer from California with the JRM Foundation, admires delicate embroidered skirts and detailed paintings of Mandalas by local artists. "These are beautiful. I can't decide which one I want," Keesee says, pointing at a yellow and blue Mandala painting. Today was shopkeeper Ram Thapa's lucky day. Keesee decided to buy a dozen paintings as personal souvenirs and gifts for friends. "This is only the second sale I've had all month," he admits. Thapa runs a small family-owned shop that only sells Mandala paintings. "We're hoping that sales improve here soon, but fortunately the demand for our products has increased in China so we have been exporting to them." 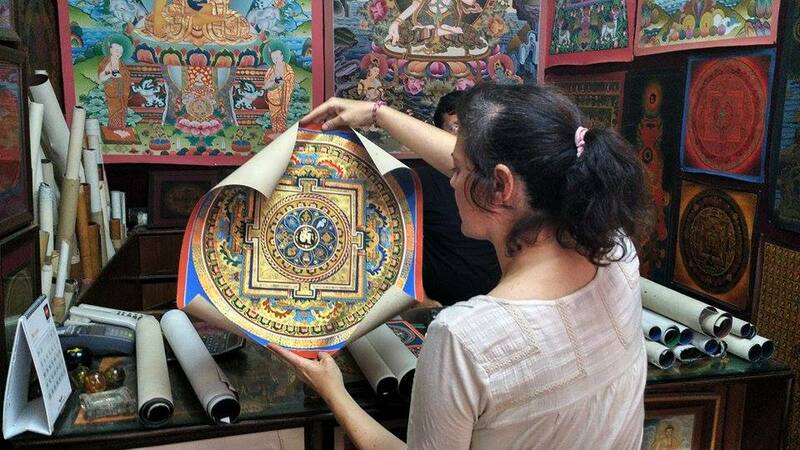 Erika Keesee picks out Mandala paintings at Ram Thapa's shop in Thamel. The usual tide of tourists into Kathmandu has definitely taken a blow, but Nepal is slowly seeing footfalls again. Last week the country signalled to the world that it's ready for tourists when it announced that the majority of UNESCO Heritage sites are now open for the public. Schmitt has visited several UNESCO Heritage Sites around Kathmandu, but was disappointed that some are still out of bounds, like the Changu Narayan Temple. "Every day we see more tourists than the day before," Schmitt notes. "I expect tourist levels will rise back up to normal in a few months." In a country where tourism is the biggest industry, it's not just businesspeople that are affected by the slowdown - the entire economy has taken a hit. Local business owners must adapt to this post-earthquake reality and squeeze through 2015, and see what next year brings. In the meantime, they are holding their breath in anticipation for more tourists to visit Nepal. A version of this article was first published in Janta Ka Reporter.